Founded in 2015 as a subsidiary of MVP Holdings (MVPH), MVP Midstream is focused on the continued development of midstream services and assets. We build and acquire assets to serve our producer, customers and market participants in the crude, natural gas and refined products space. We offer premium markets, pipeline options and flow assurance for improved netbacks. Our leadership team has 100-plus years in midstream and upstream sectors, as well as with lease purchase, and marketing and blending operations. We’re backed by the strong ownership of MVP Holdings, LLC and a capital funding commitment. 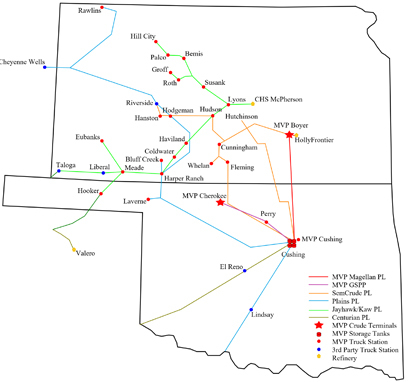 The 115-mile Great Salt Plains Pipeline transports crude oil from northwest Oklahoma to the Cushing Hub. The pipeline, along with a trucking operation and Cushing storage of 700 k Bbls, enhances the proprietary logistics and transportation capabilities we offer. MV Pipelines is a sister company that owns and operates KPC Pipeline, Beaumont Pipelines and MVP Logistics. The KPC system includes three compressor stations, pushing energy into businesses and homes all across the Midwest.